Inaugurated back in 1914, the Bilbao Fine Arts Museum is the second most visited museum in the city after the Guggenheim museum. The neo-classical style building is home to an array of artwork from the Middle Ages to the present day, boasting of artists like Goya, Gauguin, Peter Blake, Francis Bacon and Van Dyck. On visiting, you will be audience to over ten thousand works of art including several famous paintings and sculptures. Spanish and Basque artists feature prominently in the collection featuring and celebrating all that Spain’s art world has to offer. Just a short walk away from the very obviously contemporary Guggenheim museum, this museum might instill in you an appreciation for the old tropes like romanticism, renaissance, Romanesque and the gothic. The museum also has a conservation and restoration department that preserves these unique paintings from damage. As compared to the imposing Guggenheim, this small and quaint museum might just steal your heart. The museum comprises of two floors. The ground floor houses Romanesque, Gothic, Renaissance, Baroque and various Basque artists, along with some temporary exhibitions. The first floor houses Romantic, Realist and Impressionist art along with a whole section on contemporary art. The second floor has temporary exhibits. The museum also has a cafeteria for visitors, along with a restaurant called Arbolagana which is closed on Sunday and Monday evenings. Both eating joints are closed on Tuesday. Built right into a park, it can be a nice place for a picnic. The museum also promotes local artists through temporary exhibitions. Do not touch the artworks as they are fragile. Photography and filming are not permitted inside the Museum. Mobile phones are not allowed inside exhibition halls. No animals allowed inside except guide-dogs accompanying the visually-impaired. No food or drinks are allowed outside of the cafeteria. There is a check-in service for bags, umbrellas and packages that can be used by visitors as they are not allowed inside the museum. Children are allowed in the museum only with proper adult supervision. A lot of people visit the museum on Wednesday when there is no charge for admission, however, if you want to deal with few visitors, it’s best to go on some other day. The staff may be a bit obtrusive since they are preventing people from taking photographs. The museum is completely wheelchair accessible with installed ramps and lifts for easy movement. The audioguide is highly recommended as it will give you a sneak peek into each artist’s mind. Reduced admission fee EUR 5 for students, people younger than 25, people older than 65 and groups of more than 15 people. You can also get an audioguide for EUR 1. No ticket charges for children younger than 12. People younger than 25 will get free admission on Sundays, from 2 p.m. to 8 p.m.
Free admission for duly accredited teachers, journalists and guides. Free entry for the disabled (if they need someone to accompany them during the visit, the companion will be charged the reduced fee). Free entry for the unemployed. Guided visits to the museum will cost EUR 87 for a group of 20 or less and EUR 5 for individuals. This price is not included in your ticket. Metro: Metro Bilbao, stop Moyúa station. Tram: Line Euskotren Tranbia - Abandoibarra and Guggenheim stop. Bus: Routes 1, 10, 13 and 18, stop at Museo Plaza, routes 13, 27, 38 and 48, stop at Alamaeda Rekalde, routes 27, 38, 48, 72 and 77, stop at Gran Vía. Train: Abando station (RENFE), Santander station (FEVE) and Atxuri station (Euskotren). 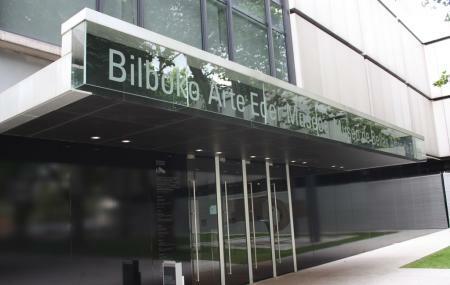 How popular is Bilbao Fine Arts Museum? People normally club together Guggenheim Museum and Palacio De Congresos Y De La Musica Euskalduna while planning their visit to Bilbao Fine Arts Museum. If you call after 6pm this museum is free. During the day it is 10 euros. Depending on how much you like fine art take your choice. Very interesting, challenging and worth a look. Has small café and shop too. Great views of the outside. The art here in general is beautiful. It's something the large majority of the population can enjoy, unlike the art at the more famous museum in the city. It used to be free on Wednesday for everyone, now there are some restrictions to the free entry. The museum also has a nice gift shop. The staff are usually helpful. Although it's not a big museum it has a lot of interesting pieces and the ABC idea of exhibiting them is great.